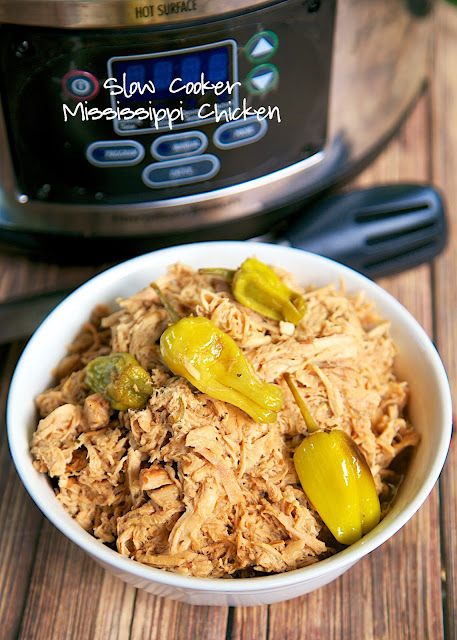 Slow Cooker Mississippi Chicken Recipe - chicken, Au Jus, Ranch, butter and pepperoncini peppers. We took our favorite pot roast recipe and used chicken. SO good!!!! One of our favorite pot roast recipes is the Mississippi Pot Roast. It has such great flavors! We make it all the time. I started wondering what it would taste like with chicken. I had to find out! I threw everything in the crock pot and patiently waited to taste the results. OMG! SO yummy!! We served the chicken over some rice. It was so good. You could also serve the chicken over mashed potatoes. Make sure to pour some of the yummy juices over the chicken and rice/potatoes. This makes a lot of chicken. I froze the leftovers for a quick meal later. We are planning on eating the leftovers on a sandwich bun with a little provolone cheese. YUM! Place all ingredients in slow cooker and cook on LOW for 6-8 hours. 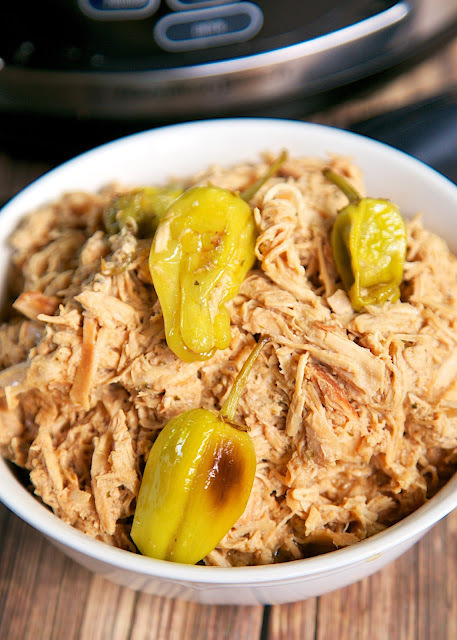 Remove chicken from slow cooker and shred. Return chicken to slow cooker. Stir and serve. (I love the pot roast version of this! My friends that I've made if for do too!) I was wondering if there is a lot of juice in this after you cook the chicken. I was thinking of making a gravy with it before returning the shredded chicken to the pot. Thank you in advance. Always good to find a new recipe for chicken. Sounds delicious. Slow cookers are a great help, especially during summer when you want to cut down on the amount of heat in the kitchen. Awesome!! Thanks for sharing. 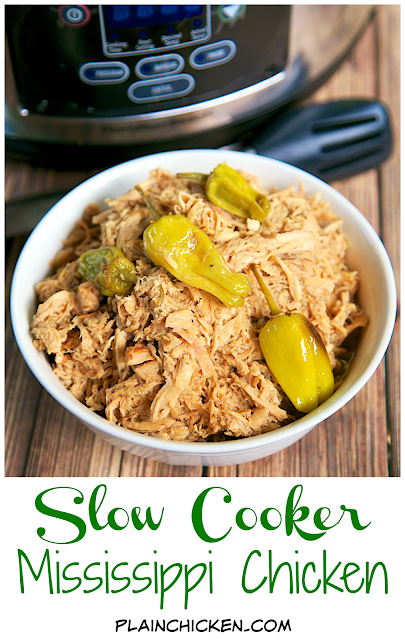 Must try - I love a slow cooker meal, especially in the summer. But what's Au Jus "mix"? Is this a packet like taco seasoning or gravy? Au Jus Mix will be in a packet next to the gravy. Stephanie, is it really necessary to cook the chicken that long? I know overcooked chicken and it messes with the texture. 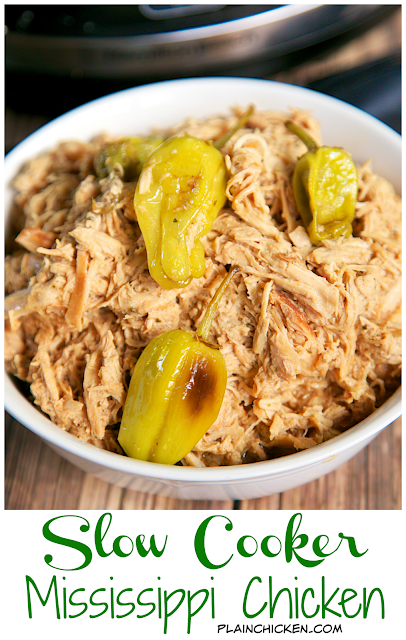 My slow cooker cooks and shreds the chicken on low in 4 hours perfectly.. I love how simple and flavorful this is! This would be great in so many things! What could be substituted for Au Jus Mix? I have several packets of McCormick Grill Mates marinade powdered mixes. I just am not good at imagining and trying things out together. Suggestions from anybody greatly appreciated. Thanks in advance. I would suggest that you follow the recipe. These specific ingredients are what make the flavor so awesome so there is no substitute in that regard. Using a slow cooker, you don't even need any liquid. I actually make this pot roast in my dutch oven so I do add a bit of beef broth, since the dutch oven does not produce liquid like the slow cooker. I also add potatoes (and carrots) to the dutch over as the potatoes will absorb a lot of the salt in the ranch and au jus. A lot of people say this meal is salty so that is how I came to alter the cooking technique.